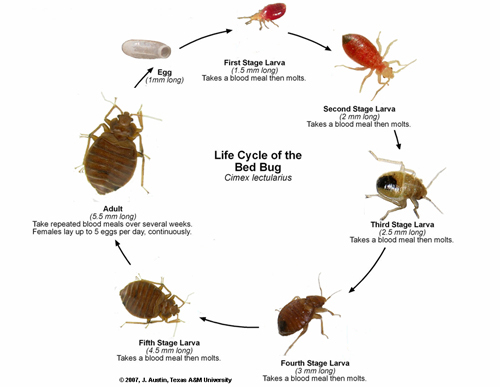 Bed bug size changes at each life stage as shown below. A bed bug egg is 1/32" long. Adult bed bugs size that has not fed will be about 3/16". After feeding the body swells and grows in length to about 1/5" to 1/4". 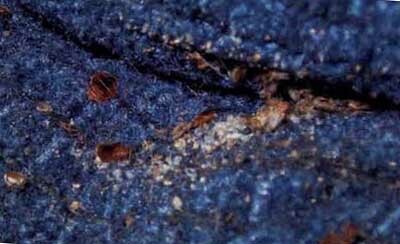 The following Bed Bugs pictures can help identify bugs in your home or apartment as well as any bites or symptoms on your body. 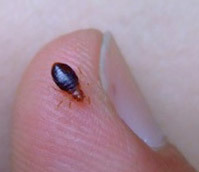 Bed bugs at all stages can be seen with the naked eye. When they hatch the insects are small, so a magnifying glass and flashlight can aid in the inspection process. 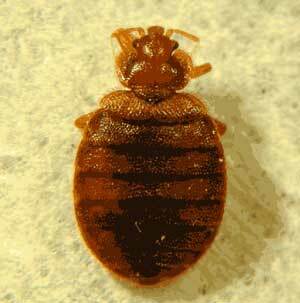 Bed bugs have a flat, oval-round body shape and have 6 legs. When looking for bed bugs in the home, first realize that they follow a lifecycle. The insects start as an egg, move through infancy (called being an Instar or nymph), followed by adulthood (see life cycle chart below and National Geographic video). In terms of skin reactions, it varies by person. 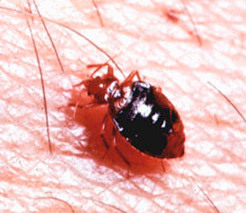 Some people are not allergic to bed bug bites and will show no skin reaction. 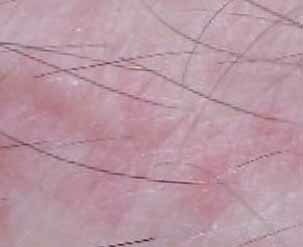 Others are highly allergic and will experience red skin bumps, irritation, and rash. Severe cases result in rashes. See pictures below for examples. At that point, she would lay eggs in the home at a rate of 3 per day. It takes 2 weeks for an egg to hatch. 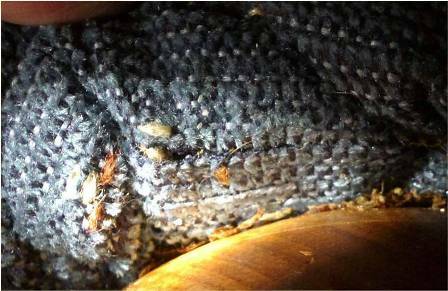 The just born nymph looks for food right away and becomes an adult bed bug in 4 months. The speed of reproduction and total life span is affected by room temperature and what is described assumes a room at 68F (20C). The adult bed bug lives for approximately 10-months, but can live without feeding up to a year if you decide to move to another room. A typical infestation has between 4 and 500 bed bugs. 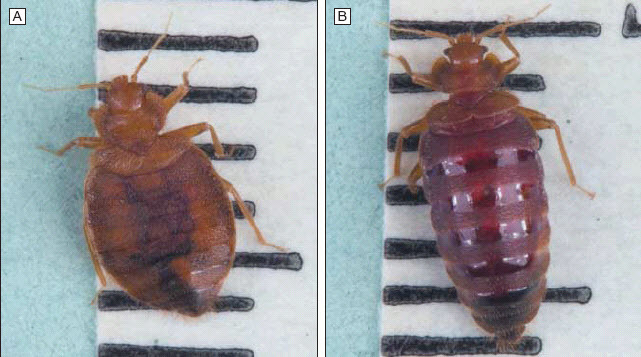 Female (left) and Male (right) Adult Bed Bugs. Males are oval shaped. Females have a more pronounced oval shape. After a blood meal appearance differences disappear. 1/5" to 1/4", eggs 1/32"
Oval with a flattened body. Antennae, small eyes. There are two ways to get rid of bed bugs, do it yourself, or our recommended method, which is to call an exterminator. Why an exterminator? Bed bugs are the hardest insect to eliminate, even for a pro. They require up to 3 treatments to eliminate an infestation. A good place to start is with a call to a national network such as Home Advisor that can certify the skills of a local exterminator (or call 866-214-8380). protect against eggs you miss. Good choices include Eco-Friendly natural kits offered by Naturasil or an insecticide based kit offered by Bed Bug Supply. More than one type of spray is needed to kill bedbugs, which is why a kit is essential. If your mattress is over eight years old and showing signs of wear you may consider replacing it. See our guide for detailed instructions on pest control for eliminating bed bugs. An army of bed bugs can attack a person 500 times in one night! See these insects in action. 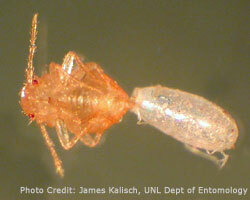 As this picture of a bed bug shows, adult bed bugs are approximately 1/4 inch to 3/8 inches long. After feeding on blood, the bug becomes a color that is a dull dark red. When the bugs are just born they have no color or look like a straw color. A bed bug only feeds on the skin for up to 10 minutes. One bug may make multiple bites. Each bed bug will feed every few days and then move back to their hiding place until they need to feed again as this picture of bed bugs shows. In this picture, the bed bug on the left hasn't fed on a host yet. The bedbug on the right is engorged with blood. Bed bugs tend to hide near the bed, with 80% - 85% of any infestation found near the mattress. However, they can also hide in nearby furniture, particularly if they were dropped in the area. 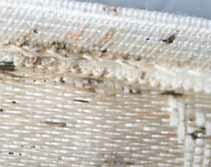 Bed bugs usually climb up bed legs or a headboard. They are attracted to the carbon dioxide exhaled by humans when breathing. Hiding spaces such as mattress seams are convenient ways to stay close to a human source for their next blood meal. Picture of Bed Bug eggs on furniture including adult bed bugs and just born bedbug (nymph). 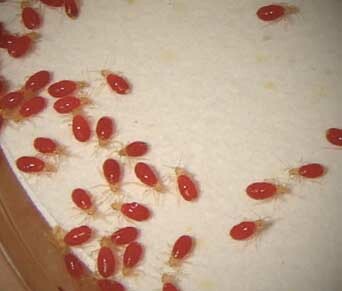 Each bed bug (females) will lay approximately 3 to 8 eggs and up to 500 eggs over their 10-month life. Each egg is 1/25 inch and is curved. The bed bug will lay eggs in a sticky cluster. A bug will feed 24 hours after being hatched. Eggs will hatch between 4 and 12 days. 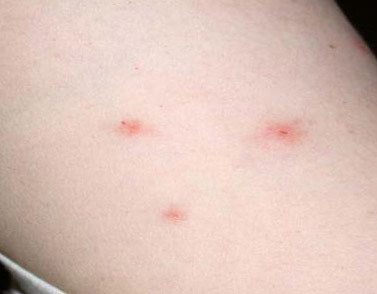 This Picture of Bed Bug Bites Results in a Skin Rash 30 Mintutes After Bite. Skin Reactions Can Appear Up to 24 Hours After Being Bitten Usually Lasts for 1 to 2 Days. While bed bugs will bite anyone, they only leave red, irritated skin reactions on people that are allergic to the bites. This is why two people sleeping in the same bed can experience no symptoms, or only one of the two people will see symptoms. 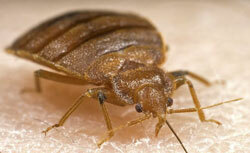 Not sure you have a bed bug infestation? Trouble evaluating your problem based on these bed bugs pictures. One good way to evaluate a bed bug is to complete this form and send to the Cornell Diagnostic Lab, with a sample bug for evaluation. See this page for more bed bug photos or here for more bed bug pictures. 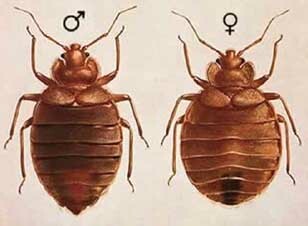 Remember that each bed bugs picture will be different from being a baby bed bug or nymph through adulthood. Bed bugs are difficult to exterminate. It's preferable to call in an expert who can confirm the presence of bed bugs, knows how to conduct a proper inspection, and who uses specialized equipment to treat the problem. The bugs multiply quickly so be sure to act as soon as you think you have a problem. Start by either getting a free quote from a reputable company like Home Advisor (call 877-673-2704 or check our list for a local bed bug exterminator near you. 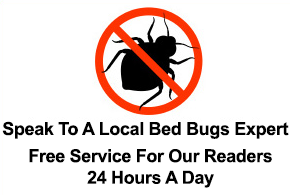 Only use companies and representatives of those companies that have specific expertise in treating bed bugs. Reader Question: I am on disability with VERY limited resources. Is it possible for me to eliminate a bed bug problem myself? Bed bugs can and DO cause mental stress as well as physical! Guide to solving bed bug problems.